When I was writing last week about Berwick House in Churchtown, south Dublin, I suggested that the house took its name from the family of the Revd Edward Berwick (1754-1820), Vicar of Leixlip (1795-1820), Co Kildare. Beriwck has been described mistakenly by some local historians as a son of the 2nd Duke of Berwick, whose mother was the widow of Patrick Sarsfield, Earl of Lucan, and whose father was an illegitimate son of King James II. However, Edward Berwick was the son of a man named Duke Berwick from Co Down. I have since had my attention drawn to David McFarland’s interesting work, Moira, fine perspective, in which he points out that Berwick Hall is one of the oldest surviving houses in Moira, Co Down, and that the Berwick family had lived in Moira for many generations. The story leads to an interesting connection between the Revd Edward Berwick and Wolfe Tone and the events of the 1798 Rising. It all goes back to Francis Rawdon (1754-1826), who was born in Moira Castle. His mother was Lady Elizabeth Hastings and in later life Francis took on his mother's maiden name and became famous as Francis Rawdon-Hastings. Once, as 10-year-old playing war games in the grounds of Moira Castle, a gun exploded accidentally and injured him in his leg. Francis was educated at Lisburn, Harrow and later at University College, Oxford. At the age of 16 or 17 he first joined the army and spent most of his life as an army officer. In 1774, he was posted to America and fought at the battle of Bunker Hill during the American War of Independence. He became Adjutant General of the British Army in America and commanded the armies, and is said to have been a courageous Generals. Some of his soldiers founded towns called Moira in memory of his exploits, one in New York State, and another in Canada where there is also a Moira River. While he was in America, he was elected to the Irish House of Commons as MP for Randalstown, Co Antrim. He was known as Lord Rowden until 1793 when his father died and he succeeded as the 2nd Earl of Moira, with a seat in the Irish House of Lords. Later, he also inherited his mother's titles as Baron Hastings, and in 1816 he was given the title of Marquess of Hastings. As the Earl of Moira, he was extremely critical of repression in Ireland and used his parliamentary office to expose the misgovernment of Ireland. In a debate in the House of Lords in 1797, he described the horrors he had witnessed in Ireland against the Catholic people. He declared that 91 householders had been banished from one of his own estates, and while asserting that he wished to uphold the Protestant ascendency in Ireland as much as his accusers, he asserted that he was asking only that the poor Catholics be allowed to live in peace. A frequent visitor to Moira House was Theobald Wolfe Tone, who hoped to persuade Lord Moira “to lead the rebellion in Ireland and so become one of the greatest men in Europe.” Moira refused but did encourage the rebels without totally committing himself to their cause. His estate was found to be one of the principal arsenals. Moira was the godfather to Tone’s son, Francis Rawdon Tone (1793-1806), and sent his chaplain to baptise the child in 1793. That chaplain was the Revd Edward Berwick. Later, the Battle of Ballynahinch was fought on one of Lord Moira’s estates in 1798. But who was Edward Berwick? The Berwick family was living in the Moira area probably since the Battle of the Boyne or earlier. Berwick Hall is a 17th century listed thatched farmhouse on the Hillsborough Road, just 400 metres from the heart of the Georgian village of Moira. It dates from 1682 and is one of the earliest surviving buildings in Moira and one of the finest examples of a yeoman’s home. The Revd Edward Berwick was born in Co Down, probably at Berwick Hall, in 1750 or 1754. It has been suggested that his grandfather was the Duke of Berwick, the illegitimate son of James II who had fought with King James at the Battle of the Boyne. However, a study of the genealogies of the Dukes of Berwick shows that is not only unlikely but is impossible. In fact, Edward Berwick’s father was named Duke Berwick, but was not related to the Dukes of Berwick, who had come Spanish grandees and aristocrats. Edward Berwick was ordained deacon by the Bishop of Down in 1776, when he was only 22, and while he was still a deacon he was the Vicar of Tullylish in the Diocese of Dromore from 1776 to 1779. Berwick then became private chaplain to Lord Moira, and while he was in this role he became a friend of the leading Irish politician of the 1780s and 1790s, Henry Grattan, and of the writer Sir Walter Scott. He was eventually ordained deacon by the Bishop of Killaloe in 1784, eight years after being ordained deacon. In 1793, he was sent to baptise Wolfe Tone’s son. Two years later he was appointed both Vicar of Leixlip, Co Kildare, in the Diocese of Glendalough, and rector of Clongish, in the Diocese of Ardagh, holding both parishes at the same time. He was married twice, published a Defence of Doctor Swift (1819), published scholarly translations from Greek and Latin, including The Lives of Marcus Valerius, Messala Corvinus, and Titus Pompinius Atticus (1812), and edited the letters of John Bramhall, the Caroline Divine who became Archbishop of Armagh. He also edited the Rawdon Papers (1819), containing much information about the 1641 Rebellion. The Irish novelist George Moore believed that Berwick “wrote the best English prose that ever came out of Ireland” and modelled his own books in the Heinemann edition on the format of Berwick’s Apollonius of Tyana (1810), translated from the Greek. The gallery in Saint John’s Church of Ireland Parish Church was added around 1871. It is said the gallery was needed because of the increase in the number of servants in the households of local landed gentry and aristocratic families like the Rawdons, Warings and Berwicks and other well-known local families. However, by then many of these gentry families had moved away from Moira. Members of the Berwick family continued to live at Berwick Hall in Moira until the 1860s. It was bought in 1861 by George Wilson, whose descendants still live there. As for Francis Rawdon, Earl of Moira and Marquess of Hastings, he sold his estates in Ulster around 1800, and after his mother died in 1808 he sold Moira House in Dublin too, bringing to a close his associations with Ireland. The Moira and Hastings titles died out in 1868. 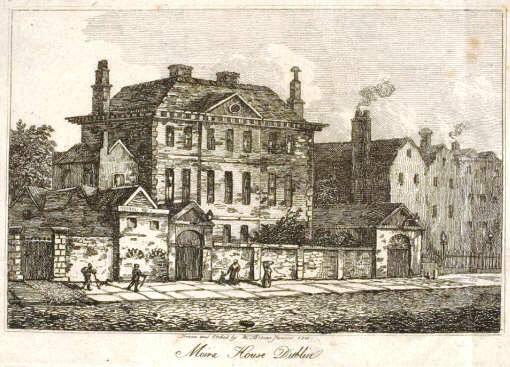 Moira House on Usher’s Island in Dublin became part of the Mendicity Institute but it was demolished in the early 1950s after its top floor had ben lopped off some years earlier. But all of this is a digression, and none of it helps to answer my earlier question about the identity of “Lady Berwick” who is said to have founded a holiday house for working girls in Berwick House, which became the headquarters of her charity, known as Berwick Home, and whose name survives in Berwick House in Churchtown. I still need to carry out more research.